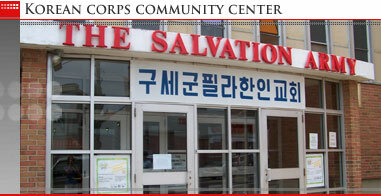 The Salvation Army Philadelphia Korean Corps Community Center serves the community of North Philadelphia. Currently, The Salvation Army Korean Corps has 30 adult members in addition to a number of children and teens that regularly attend. On Sunday morning the church is alive with worship service, teen bible study, children’s Sunday school class, choir and band practice, and a fellowship luncheon. Prayer and studying God’s word are highly valued in Korean church culture, and members of the congregation participate in additional worship services during the week. They also gather weekly at each others’ homes for small group Bible study, led by members of the congregation. The congregation also participates in outdoor worship services, beach picnics, and gatherings with other Salvation Army Korean congregations from New Jersey and New York. The Philadelphia region has the fifth largest concentration of Koreans in the country, and the Korean faith community is thriving with over 200 Korean churches; some with thousands of members. The Salvation Army Philadelphia Korean Corps is the only one of its kind in Philadelphia and one of only three Salvation Army Korean congregations in its entire Eastern Territory. Captains Do sung and Jae eun Park are the commanding officers. Captain Do sung was raised attending The Salvation Army in Korea where his parents are Salvation Army officers. According to Captain Do sung Park, traditionally, Korean churches are an essential part of life for Koreans living in the United States. They are a valuable resource for the Korean community because they teach, reinforce and pass on Korean language, culture and values to the next generation. The Korean church is also a place that first generation Koreans feel at home because it provides a familiar environment with a shared language and offers the community the services and support that are specific to their needs. Captain Park would love the number of Salvation Army Korean Corps locations to grow in order to have a wider impact serving the Korean community in this region. Captain Park is driven to develop the Army’s “brand name” as he and his wife work to further its mission as a church in the surrounding area. In order to make The Salvation Army easily recognized as a church within the greater Korean community, the Corps actively engages the community through targeted outreach programs. For example, during the Christmas season, the Corps maintains The Salvation Army’s signature red kettle in the heart of the Korean Market. The kettles raise funds, but also generate important opportunities to tell people about the full breath of The Salvation Army’s services and its role as a church. Appropriately, the money raised at the Korean Market is invested right back into the community; helping Korean senior centers, handicap programs, and youth development. In the spring, the Korean Corps’ Women’s Home League program prepares Easter eggs that the congregation distributes to the community.